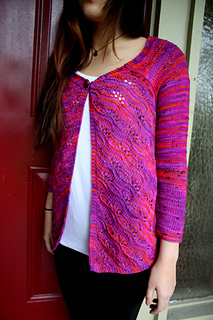 Darlina is a cardigan worked in diagonal patterns to make the most of crazy variegated yarn. Worked from the bottom up in panels for the body, with the sleeves worked flat as well, and then all seamed together and the collar is applied. Darlina makes variegated yarn sing with the bias constructions and the variation of feather and fan lace to make the stitches move. Darlina is shown on the model with about 4” of positive bust ease to make a nice swingy coverup. 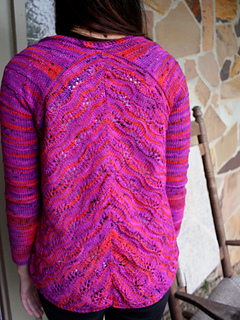 Worked up in sport weight yarn, Darlina will take you through all the seasons. Instructions for the lace panels are provided in written and charted format. Darlina makes a great traveling project because the panels and sleeves are nice small project pieces. Available in bust sizes 32 (36, 40, 44, 48, 52, 56)“ / 81.5 (91.5, 101.5, 112, 122, 132, 142) cm. Uses 4 (5, 5, 6, 6, 7, 8) skeins of Space Cadet Lyra Sport.